As a group of friends come together to cover up a murder, they end up stranded deep in the desert, and have to band together to make it out alive. The further they venture into the darkness, the closer they come to discovering that each one of them is more dangerous than anyone had ever realized. It’s only a matter of time before they understand... Four people can keep a secret, when three of them are dead. The shooting style of "Friends Don’t Let Friends" keeps a fast paced momentum, and continually engages the audience in a voyeuristic way. Jamie and Lyndee brought a docs-style feel to a violent and twisted horror story that truly makes it hard to look away. “I knew from the beginning that Friends Don’t Let Friends had to feel visceral for the audience. I wanted them to feel like they were watching something they shouldn’t be allowed to see, with people that felt familiar and close. Each group of friends has a Stephanie, a Dave, a Jeb and a Carrie. My hope is that we’ve created something that lingers with you long after that first watch,” Jamie S. Brown said. 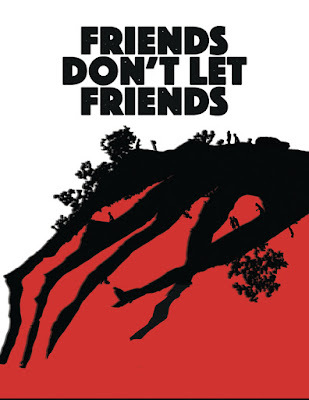 "Friends Don’t Let Friends" stars Jake White (SYFY’s Children of the Corn 2009), Brittany Anne Woodford (A Family Man 2016) Jenny Curtis (Any Bullet Will Do 2016), Brendan McGowan (Sweet Darling 2016) and Kanin Guntzelman (NBC’s Southland 2013). Brownwell Entertainment is a husband and wife team helmed by Jamie and Lyndee Brown. Lyndee is a Reality TV Executive Producer, whose career has spanned every style and genre of non-scripted television. Jamie is a writer, director and cinematographer, with a background in commercials, music videos and documentaries. The combination of their unique points of view, has turned "Friends Don’t Let Friends" into a raw, suspenseful, and psychologically twisted horror film that even in its wildest moments still feels grounded in reality. John Stevens composed the score for "Friends Don’t Let Friends," his unique style and cinematic soundscapes were something that Jamie was drawn to back in 2007 when a friend recommended John’s band Ghost Machine. The style of music was unlike anything Jamie had heard before and they have been working together for almost 10 years. "Friends Don’t Let Friends" is John Steven’s and Brownwell Entertainments first feature collaboration. “There are moments in John’s music where the music feels like another character, someone sinister and dangerous thats watching the scene unfold with the audience. The soundtrack alone is a ride into darkness,” writer/director Jamie Brown said.